Robbin Marcus is a multi-faceted Music Education Consultant with specialties in folk music and dance. She has over 20 years experience behind the microphone. She has led classes for children and adults at dance weeks sponsored by the Country Dance and Song Society (CDSS) and the Lloyd Shaw Foundation. Robbin was the Program Director for CDSS Family Week at Pinewoods in 2006-07. A well-known traditional dance leader, Robbin is an advocate for accurate performance styles in the music classroom. 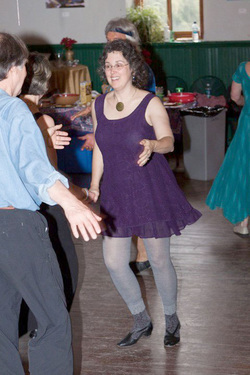 She regularly leads contra dances both in the Southeast and Mid-Atlantic. Robbin is a rotation caller for the Chattahoochee Country Dancers (CCD). Robbin has led caller's workshops and is in demand for advanced dances.